Preheat oven to 180 degrees. Coat the carrots in the olive oil and season with a pinch of sea salt. Place them onto a lined oven tray and roast for 25-30 minutes, or until tender and cooked through. Meanwhile prepare the couscous mix according to packet instructions. Place all the carrot top pesto ingredients into a small food processor, blend until smooth and set aside. Heat a small frypan over a medium heat, add the cumin seeds and toast for 30 seconds, or until fragrant. Remove the seeds from the heat and grind down to a powder in a mortar and pestle of coffee grinder. Mix the ground cumin, a pinch of sea salt flakes and yoghurt together in a bowl until combined. 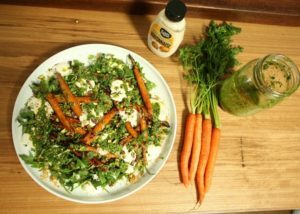 Spoon the yoghurt dressing onto the base of serving plates and top with the couscous, rocket leaves and roast carrots. Scatter over the pesto, pistachio nuts and reserved extra carrot tops.